How will Riley Cooper's deal affect Julian Edelman's market? It appears the Eagles will be retaining both of their high profile free agent receivers. 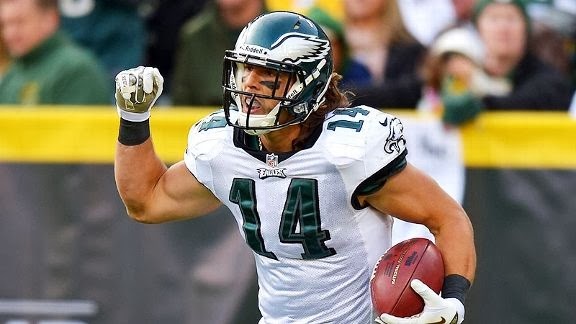 There's reportedly mutual interest between team and player on a return from Jeremy Maclin, and the team ensured Riley Cooper won't even see the market by agreeing to terms on a 5 year, $25 million deal. Any news about this years free agent receiver market is pertinent to the Patriots, who have 2013 leading receiver Julian Edelman set to hit the open market. The league-wide market for Edelman's services will likely determine whether or not Tom Brady's favorite target returns to Foxboro next season. Cooper getting those kind of numbers can only help Edelman's bid for a payday. You can already practically hear his agents pointing to the money paid to Cooper and then comparing their client's production to those his. Cooper just got $4.5 million (the annual average of his five year deal) after a 47 catch, 835 yard, 8 touchdown season, while Edelman caught 105 passes for 1,056 yards and 6 touchdowns in 2013 and was also one of the league's top punt returners. Despite that clear disparity in production, Cooper's deal might not help Edelman as much as Minitron might hope. At 6'3" and 222 pounds, Cooper is a big, physical threat outside the numbers, and thus is utilized much differently than the 5'10", 198 pound Edelman. While Cooper's deal will help set the market for outside receivers, slot receivers are generally valued differently (aka less) than outside guys; just ask Wes Welker and his agent. The precedent for Edelman's new deal could come from his teammate, Danny Amendola, who makes $5.7 million a year (over five years) and caught 54 balls for 633 yards and 2 touchdowns while fighting through a painful groin injury in 2013. Despite his undeniably great production in 2013, it's not necessarily a slam dunk that the Patriots bring Edelman back. Simply being able to afford him isn't the issue; as our Michael Hamm noted earlier today, the rising salary cap should make it possible for the Patriots to have room to retain all their key free agents if they choose to do so. However, it's difficult to envision them committing a combined $10-12 million a year to two players who essentially play the same role, and the prudence of doing so is certainly worth questioning. While many Edelman backers have advocated cutting Amendola to make room for Edelman, citing the former's troubling history of injuries, those people fail to note that Edelman's medical history is nearly as troubling. Edelman was a rock in 2013, playing all 16 games and developing into Tom Brady's go-to guy, but before that missed 16 games due to injury in his first four seasons. The argument can still be made that Edelman's prowess on punt returns and rapport with Brady make him a better investment, but either receiver represents a risky long-term investment due to legitimate questions about their ability to stay healthy. If the Patriots do feel the need to choose one of their injury-prone slot receivers over the other, the rising salary cap projections could play in Edelman's favor. Cutting Amendola outright will actually cost an extra $225,000 against the cap for 2014, but the Patriots could designate him as a "Post June 1st" cut, allowing the team to split his remaining guaranteed money into two separate cap hits. Doing this would put the Pats only on the hook for Amendola's $1.2 million in bonus money on this years cap, while combining the remainder of his signing bonus into a $3.6 million cap hit in 2015. While you never like the prospects of eating $3.6 in dead money, that will be much easier to swallow if the 2015 cap follows projections and exceeds $140 million. Of course, the rising cap also makes the idea of signing Edelman alongside Amendola a little more palatable. Doing so would give Amendola another chance in New England, which I think he deserves (the guy looked Welker-esque in the preseason before his injury). Edelman and Amendola could bizarrely serve as insurance for each other in this scenario, and Amendola's ability to also play outside means the two could complement each other if both are healthy. If Amendola continues his struggles to stay on the field, cutting him next year will save the team $2.1 million against the cap, with those savings jumping to $4.3 million in 2016 and $6.5 million in 2017. The other consequence of the NFL's rapidly rising salary cap is extra cap space for Edelman's potential suitors. While Edelman's injury history, perceived reliance on Tom Brady and position as a slot receiver all might be held against him on the market, all it will take is one team to overlook those question marks in favor of his 100 catch upside. The Patriots are notorious for drawing a line and refusing to exceed that price in negotiation, and another team with cash to burn could quickly push Edelman out of that price range. In short, Cooper's deal helps Edelman, at least in the sense of starting to establish a market for secondary receivers. However, the question of whether there's a team out there willing to overlook Edelman's injuries while valuing him is what will ultimately decide his market, and likely whether he's back in a Patriots uniform next season. As usual, my cap numbers are coming from the excellent OvertheCap.com.